The Mandrill had been classified in the baboon family but recent research determined they should have a category all their own called genus Mandrillus. Mandrills are the largest of the monkey species and the most colorful mammal. Charles Darwin wrote “no other member in the whole class of mammals is colored in so extraordinary a manner as the adult male Mandrill.” The brighter the red stripe on the face is, the more viral the male, and as he ages and falls from dominance this stripe lightens. Mandrills live in large multi-family units call hordes with some of these groups reaching 850 individuals. This species lives naturally in the rain forests of equatorial Africa. The average male might weight 77 pounds while the female weighs only 25 to 30 pounds. 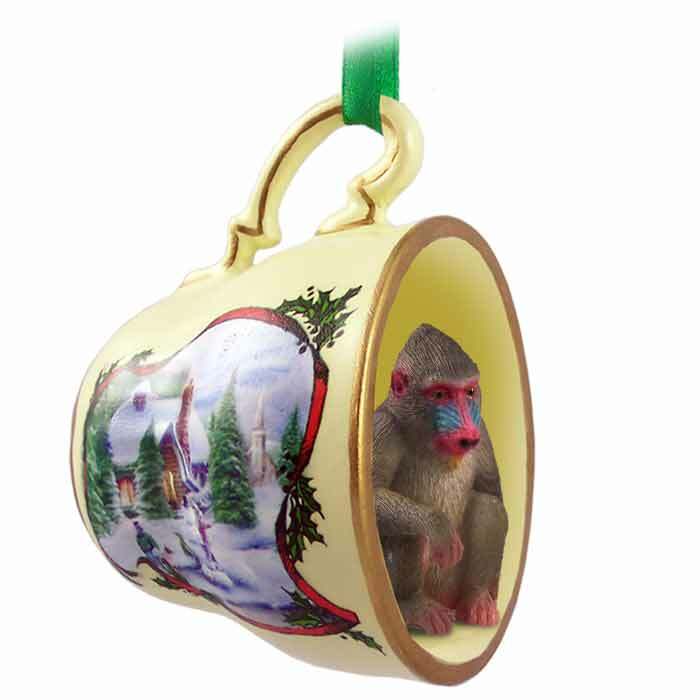 We combine our Tiny Ones series of hand painted, specie specific figurines with our Holiday Scene decorated tea cup to create a delightful three dimensional ornament perfect for any special occasion like birthdays or Christmas. Great item to hang on your Christmas tree or an everyday display as well! Each tea cup is 2” tall and 2 ½” wide with a molded handle which has a green ribbon tied in a bow! The tea cups are decorated with a gold toned rim and decorative stripe on the handle. On the outside, both sides are decorated with a tiny delicate winter holiday scene including a snow covered cottage and pine trees, plus berries and leaves. These unique items are hand painted stone resin and individually blister packaged, ready to give as gift or hang in your store. PLEASE NOTE- Sturdy metal Display stand (OH1) is available; see the tea cup display category!